We just released a program for doing Gaussian Process regression called gpr1. The program is written in C and you can find it on our data mining page. Gaussian process regression is a powerful and flexible form of regression analysis that can be useful for modeling things like climate and financial markets. I'm just going to give an extremely brief overview of what the program does. The program is free and distributed under the GNU General Public License. where \(\sigma_s^2\) is called the signal variance, \(\sigma_n^2\) is called the noise variance and \(h\) is a length scale parameter. If there is no noise in the training points then set \(\sigma_n^2=0\). In general you will have to experiment with values for \(\sigma_s^2\) and \(h\) given the particular problem you're trying to solve. For a good discussion of this and anything else related to Gaussian processes see the book: Gaussian Processes for Machine Learning. The figure below is a simple example of what you can do with this software. 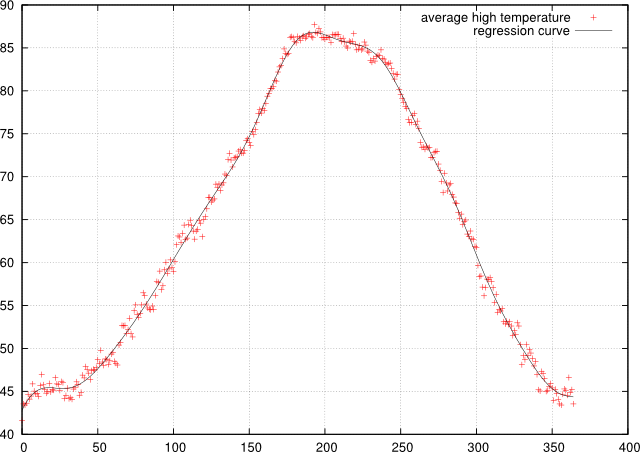 It is a plot of the mean high temperatures in Boulder Colorado for every day of the year starting on January 1. The points marked with red crosses are the mean values calculated by averaging the daily high temperatures in Boulder for the last 117 years. The source of the data is the NOAA Earth System Research Laboratory. These points are used as the training data set to calculate the regression curve shown as a solid black line.